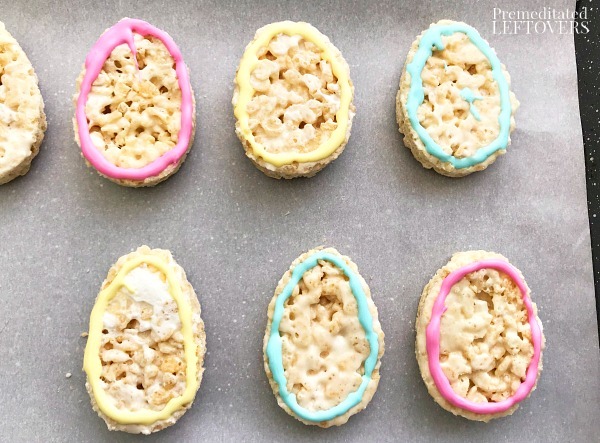 This Easter Egg Rice Krispie Treats Recipe is not only a delicious dessert, but it is also a fun activity to do with your kids. 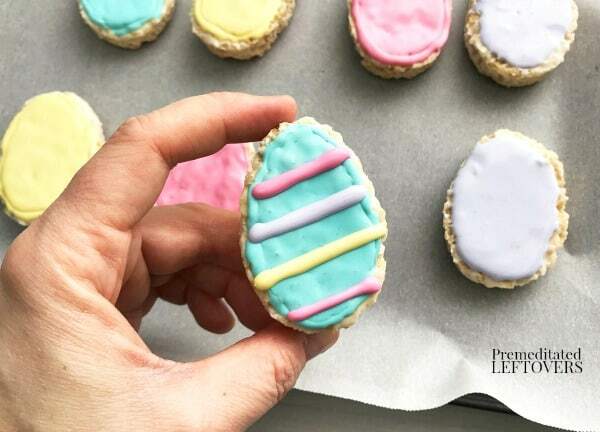 Instead of making sugar cookies for Easter, you can use an egg cookie cutter to cut out Rice Krispie Treats into fun shapes. Then use icing to decorate them just like you would sugar cookies. 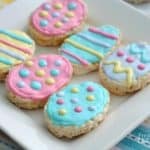 This Easter sugar cookie variation of Rice Krispie Treats is more forgiving than sugar cookies and no baking is required making it a fun activity to do with children. 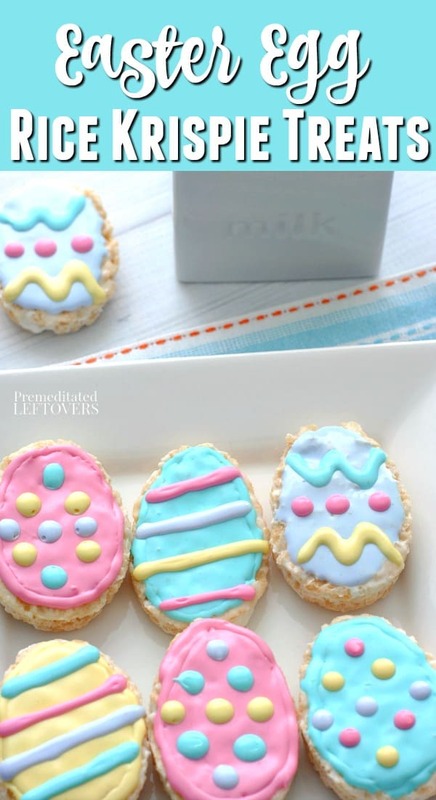 Makes approximately 12-14 Easter Egg Rice Krispies using a 2″ x 2 3/4″ egg-shaped cookie cutter. 1. 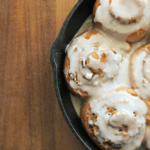 Line a 9×13 baking dish with parchment or wax paper. 2. Add the mini marshmallows and butter to a large saucepan or dutch oven and heat on medium-low heat, stirring occasionally. 3. 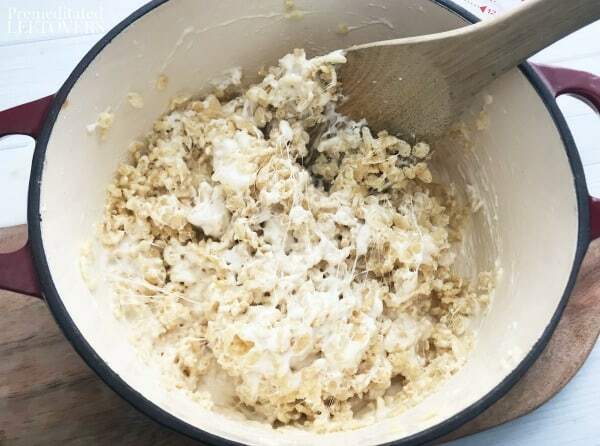 Once the mixture is about 3/4 melted, fold in the Rice Krispie cereal until it is completely coated. 4. 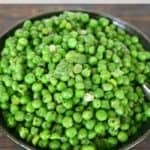 Pour the mixture into the prepared baking dish and gently press down. 5. Place the Rice Krispie Treats in the fridge for 30 minutes. 6. 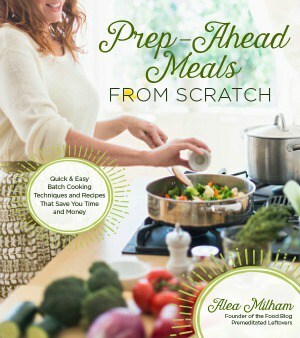 Line a baking sheet with parchment or wax paper. 7. Remove the treats from the fridge and use the egg shaped cookie cutter to cut out each treat and place them on the prepared baking sheet. 8. Divide the white icing between the ramekins and add 1-2 drops of food coloring to each dish and mix. 9. Scoop each colored icing into a small sandwich baggie. Snip a small amount of each baggie corner so you can decorate the cookies. 10. 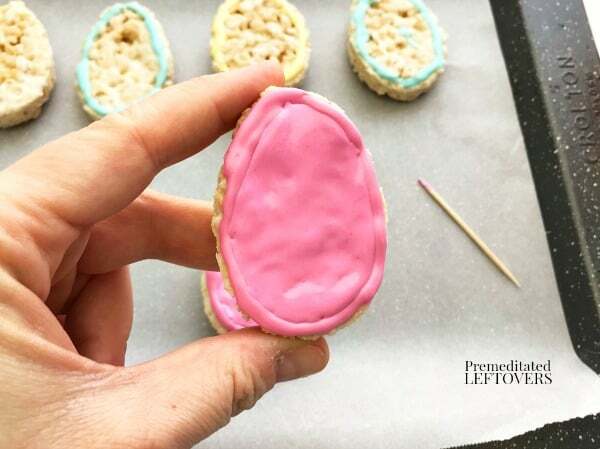 Outline each Rice Krispie egg with your choice of colored icing and let the outline set. 11. 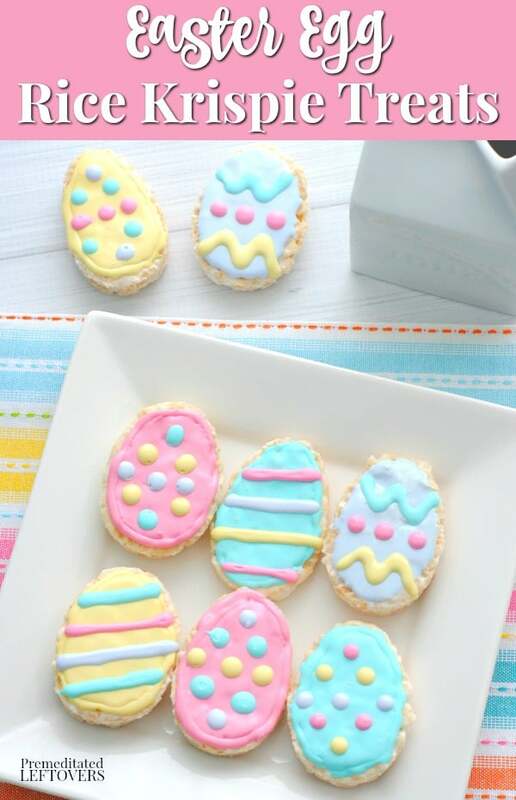 Flood the inside of the outline with the same icing color and use the toothpicks to gently fill in each egg. Let the colors set. 12. Once all the eggs are frosted, use the remaining colored icing to decorate the eggs with stripes and dots. 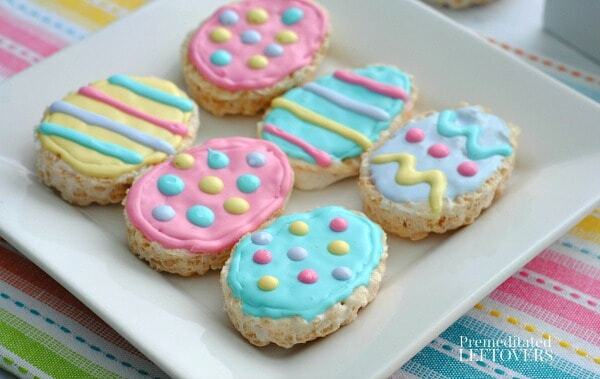 Use a cookie cutter to make egg-shaped Rice Krispie Treats then use icing to make them look like sugar cookies. 6 cups Rice Krispie cereal off brand works great too! Line a 9x13 baking dish with parchment or wax paper. Add the mini marshmallows and butter to a large saucepan or dutch oven and heat on medium-low heat, stirring occasionally. Once the mixture is about 3/4 melted fold in the Rice Krispie cereal until it is completely coated. 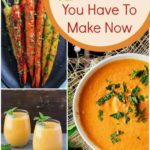 Pour the mixture into the prepared baking dish and gently press down. Place the Rice Krispie Treats in the fridge for 30 minutes. Remove the treats from the fridge and use the egg shaped cookie cutter to cut out each treat and place them on the prepared baking sheet. Divide the white icing between the ramekins and add 1-2 drops of food coloring to each dish and mix. Scoop each colored icing into a small sandwich baggie. Snip a small amount of each baggie corner so you can decorate the cookies. Outline each Rice Krispie egg with your choice of colored icing and let the outline set. Flood the inside of the outline with the same icing color and use the toothpicks to gently fill in each egg. Let the colors set. Once all the eggs are frosted, use the remaining colored icing to decorate the eggs with stripes and dots.